Gurgaon's Newest Co-Working Space Has A Pretty Garden Terrace! Want clean, sunlit and comfy interiors for your workspace? 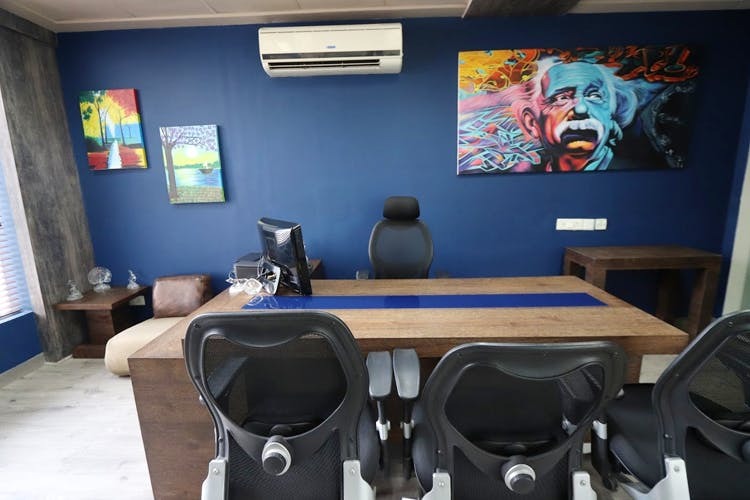 Gurgaon’s newest co-working space, Co4U is bringing a whole new collaborative environment in the city’s buzzing area, Udyog Vihar. Starting at just INR 399 (plus GST) for a seat per day, this space offers a cool environment for all guests, including entrepreneurs, freelancers and clients. They have unlimited WiFi through the day, and a whole range of sumptuous snacks at affordable prices to keep us fueled. The space itself is hip, with graphic wall paintings and vibrant dark blues, as well as comfortable yet, uniquely-styled furniture, bar stools and cushions. More importantly, there is ample area to get together with 200 operational seats and more coming in. And for all those times when we need creativity pouring in with the entire team to work out those big plans, collaborate together at their huge 8-seater meeting room. With emphasis on the need for fresh air and lounging about in the open, there is also a terrace garden underway with pretty decor and lots of greenery. Just a little addition to the happy surroundings, especially when the routine gets monotonous. If all this already sounds exciting, get a monthly subscription for just INR 5,999 (plus GST) per seat. Located just a stone’s throw away from Delhi and off the NH8, we are sure to hang out here often and get work done in style.